In order to spread awareness of the Hunger Crisis in Somalia, artist Dan Eldon engages aesthetically with African culture to catalog the effects of Imperialism on a native identity. The nineteen limited edition Photo-Primitivist prints featured are mixed media masterworks, with a social message to jewel the crown. At the age of 22, Eldon’s persistent photographic journaling for outlets including Newsweek, Time and more, launched an international relief campaign, Operation Restore Hope that helped to save the lives of thousands of starving Somalis. Considering his activism sparked such immediate and tangible impact, his untimely death only two short years later in 1993 while on pursuit of his art is an unimaginable tragedy. The artworks in the show fossilize a moment in time before the explosion of digital media and international pluralism for a truly original perspective on tragic events still taking place today. While in visual dialogue amongst artists such as Peter Beard, Raphael Mazzucco and Arno Elias, Dan Eldon stands out for his brute sense of Expressionism and Primitivist elements. A semicontemporary of Jean-Michel Basquiat, the artist embodied the subject that he painted in more ways than one. Poppy red painted panels vibrate atop repetitive elements, collaged with portraiture and the quotidian remnants of film canisters, tins of caviar and the like. Born in England but having grown up in Africa since the age of 7, Eldon captures the culture from an interior perspective. 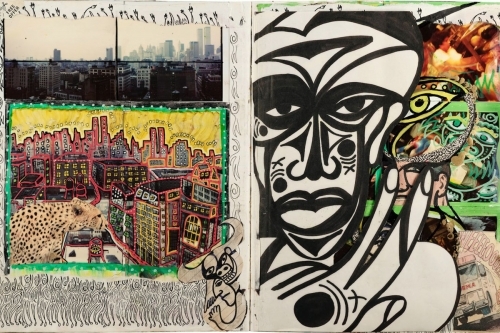 Works such as NYC African Self Portrait, draw the viewer inside the empathetic mindseye of the artist, juxtaposing concrete jungles with the real thing. While he traveled back and forth from Western metropolises to Somalia and Kenya, it is clear Eldon’s heart was with the people whose struggles he had witnessed in his formative years. Struggle as a human experience is often coupled with long, drawn out days of lonesome boredom; the artist’s inclusion of mundane elements and small details suggest he could relate to his subjects in deeper ways than journalists or hobbyists, and lend the body of work a sense of authenticity. This ‘temporality of pain’ is conveyed by intricate pen and ink sketchings, which capture a greater sense of care and time-spent than is seen in many more brashly handled expressionist works. Especially in the medium of photo-collage, this sense of elaborate detail and compositional balance is quite rare—Dan Eldon makes it look effortless. The caviar tins in Caviar emphasize a cultural inequity that has exploded since the artists passing, making the artworks ever more relevant today. Imperialism is still blazing across Africa, simultaneously creating the worlds wealthiest cities including Angola and Lagos, while turning a blind eye from entire countries that are being wiped out and destroyed by war, famine and disease. The artworks in the show are more documentarian than outspoken, which allows the viewer to muse their own opinions on the works’ ethnographical framework. In this sense, “The Journey Is The Destination” unveils the artists’ sense of helplessness, which has become a nearly universal phenomenon today. In 5 Months In Kenya the Sharpie-etched wordplay ‘too true to be good’ cavorts below images from a Western-style Safari, highlighting a sense of ‘other’-ing that takes place all too often in the Imperialists’ experience. Sexual repression, racial dominance and the glorification of mass extinction by hunting are part of a dark world that is candy-coated on such excursions; these practices have remained largely unchanged since the artist’s death. Across all pieces in the show, the sense of Primitivism that connects the artworks to their subject culture is more energy-based than artifactual, giving the pieces a modern and international flair. The subversive elements come with a light hand, and fit visually into a late-80s/early-90s art scene that saw the rise of the Young British Artists (YBA) in London and the development of the Chelsea Gallery District into what it is today. Eldon is featured in the prestigious private collections of some of the Art World’s elite: Diana Rockefeller, Bruce Weber, Julia Roberts, Christiane Amanpour, Madonna, and more. An assortment of artworks inspired by the artist will be on display as well, including Spanish-born New Yorker Domingo Zapata, breakthrough pop-realist painter Alexandra Grounds and Canadian photovisualist Damián Siqueiros. The exhibition at HG Contemporary runs alongside a documentary of the same title; “The Journey Is The Destination” tells the story of the artist’s life and work. The documentary was produced by Kweku Mandela and directed by Bronwen Hughs and is currently available for view on Netflix and all VOD platforms. The artist’s journals were discovered by his family after his passing, and Mandela helped to organize these chronicles as well as create the film to share the posthumous story of the artist’s short yet impactful life. With a roster of impressive contemporary artists and a knack for identifying diverse new talent, Philippe H. Guggenheim acts as a patron of the arts in more ways than one. Fostering talent under the umbrella of HG Contemporary as well as partnering with organizations to benefit the international community, Philippe has been building his empire in the arts since 2014. The exhibition “The Journey Is The Destination” is a partnership with Creative Visions and Trotta-Bono Contemporary, and will benefit Creative Visions nonprofit 501(c)3 organization. For more information: 212.366.4490. Exhibition dates: 7 September 2018 - 1 October 2018. Opening Event: Thursday, September 6th from 7-10pm.